St. Basil the Great was amazing, and lucky, too! Surely St. Basil's parishioners remember when the relic of St. Basil was brought to the church by Father Luke and blessed by the bishop. I was very lucky to be in town. St. Basil the Great was an amazing person whose many achievements/qualities included serving the poor and underprivileged, after having been born into wealthy family -- an important example for all. 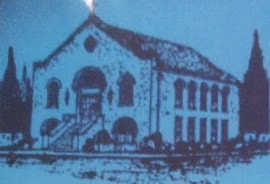 Many parishioners also probably know that the church was named for St. 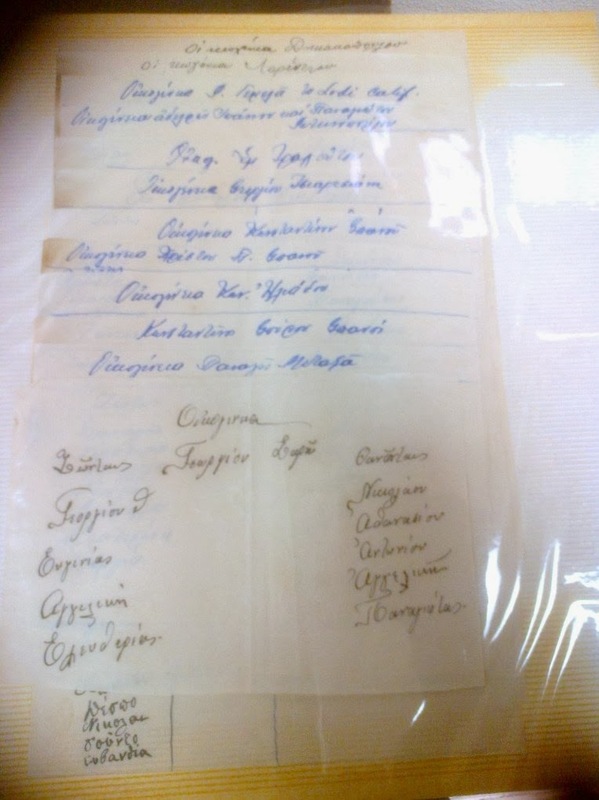 Basil by lottery on December 7, 1930 (presided over by the bishop of that time). 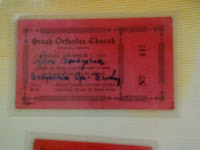 Stockton area Greeks bought tickets for $5 and wrote the name of the saint they favored right on the ticket. The winners were Stamatia and Emmanuel Xenakis...and St. Basil, of course. But have you actually seen winning ticket #447? While in Stockton rummaging wherever I could for historical information about my family, Eleni directed me to photo albums in the church's Fireside Room by saying, "There are more in the cardboard box on the floor." Voila! One of those albums has the winning ticket, plus a few other historical documents relating to the consecration of the new church. A letter gives witness to the fact that my Papou George Sarris was one of the founding Board members. Rows of little slips of papers for each family included the names of current family members and those deceased -- much like the slips turned in today for special prayers by the person who baked the andithoron. My best guess is that each family turned one in for blessings when the church was consecrated in 1932. In any case, each slip contains important historical information. There is a lot of information in those albums -- one with community obituaries, some with Festival pictures/articles, and others carefully organized/donated by parishioners who wanted to memorialize some Church milestone or other activities as the church was the gathering place for all things Greek. Others are just waiting for someone to come along and reorganize them, to create that comprehensive history of St. Basil's and the Stockton area Greek-American Community. Will that be you in 2014? KALI HRONIA! I recently came across a dog-eared, mimeographed (yes, I said mimeographed!) 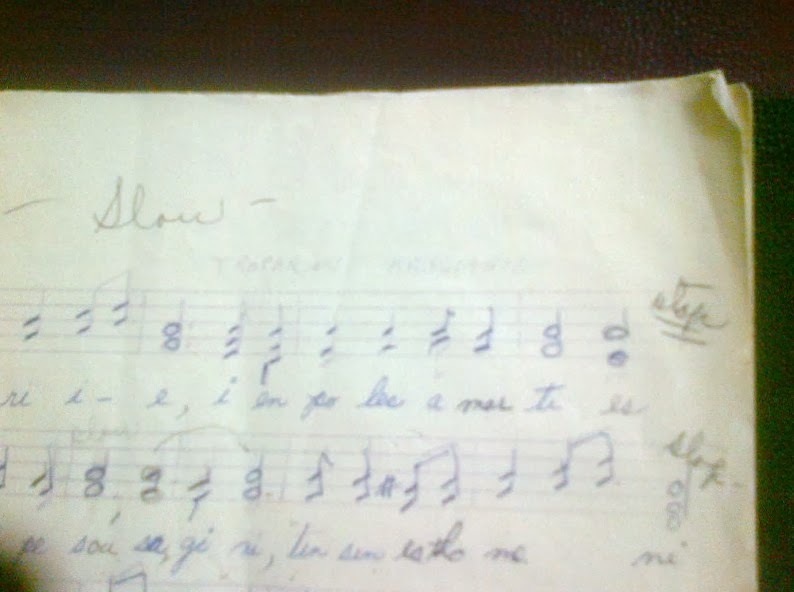 copy of the "Troparion Kassianis," a hymn sung during Holy Week and my mom's favorite. Many notes have been darkened with a pen, and there are some handwritten directives. Some might remember the Good Tuesday duo of Angeline Xanttopoulos and Dorothy (Trachiotis) Henning. Mom was a stalwart of many services at St. Basil's, often playing the organ and singing at the same time. When she died, the monies contributed to the Memorial Fund in her name were used for an icon that graces the choir loft today. Long ago, there were a few Friday nights during Holy Week when my mother and I were the only ones up in the choir loft on Stanislaus Street. 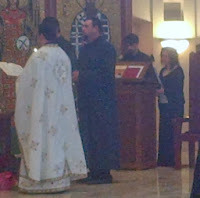 There were other special hymns, like "Soma Christou" (my personal favorite). And for the Christmas season, the various "kalanda" with wishes for KALI HRONIA. Those tunes are indelible, and I continue to sing along from my pew whenever I attend services in Stockton or anywhere else -- much like you probably do. The family tradition of singing during St. Basil's Church services goes back to my Yiayia Sarris, who, having not been allowed to join the convent in her village of Koroni, continued her religious ways in Stockton. She often filled the role of "psalty" (cantor) at St. Basil's in the early days...and later sang along from her pew. Perhaps this is why I have been especially touched in recent times to hear Demetria Veziris chant during services. Her sweet renditions of prayers and hymns remind me of my Yiayia. And there are not that many women cantors. So I am thankful each and every time I am able to hear her. But I can't be in Stockton often enough...anyone have a recording they can send me? 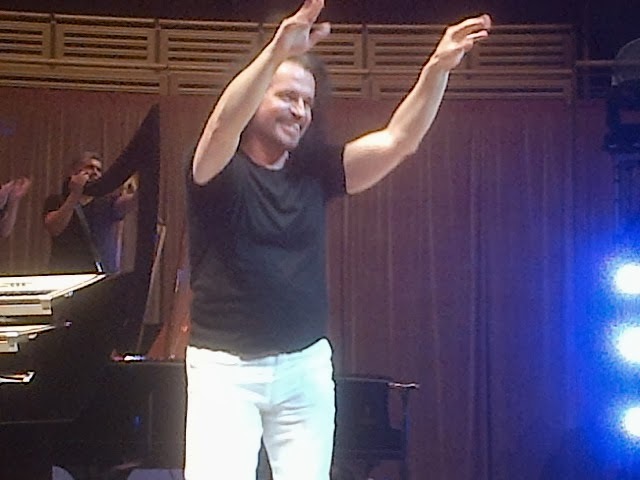 Had to let you know that I attended a 2-hour concert last night by Yanni and his orchestra in Miami -- and even though there wasn't much Greek about it per se, I felt supremely proud of this whirling dervish from Kalamata. Yiannis Chrysomallis was never much of a slouch. He was a champion 14-year-old swimmer before leaving Greece to major in psychology at the University of Minnesota. He then devoted himself to music with about 300 songs and 19 recordings to-date. 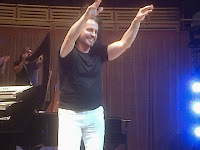 His "Yanni in Concert: Live at the Acropolis" has been viewed one way or another by 1/2 billion people worldwide via Public Television. And while his amplified music is called New Age with a keyboard and synthesizers, the other 13 orchestra members + 2 sopranos from places far and near -- especially on violin (Armenia/USA) and harp (Paraguay) -- were totally amazing virtuosi. They are a happy bunch totally respectful of one another.